Ketones and other carbonyl compounds containing a hydrogen adjacent to the carbonyl are in the equilibrium with a constitutional isomer called enol. Protonation of enolate into oxygen leads to enol which is an unstable isomer of aldehyde or ketone and it quickly transforms into a carbonyl system, or simply it tautomerized. Keto-enol tautomerism is an equilibrium process in which two constitutional isomers are involved. These isomers are called enol and keto tautomers. Although this is a reversible reaction, the keto form (usually) predominates and once the equilibrium has been reached, the concentrations of ketone and enol can be measured. Keto-enol tautomerization is catalyzed by of acid or base (even trace amounts). 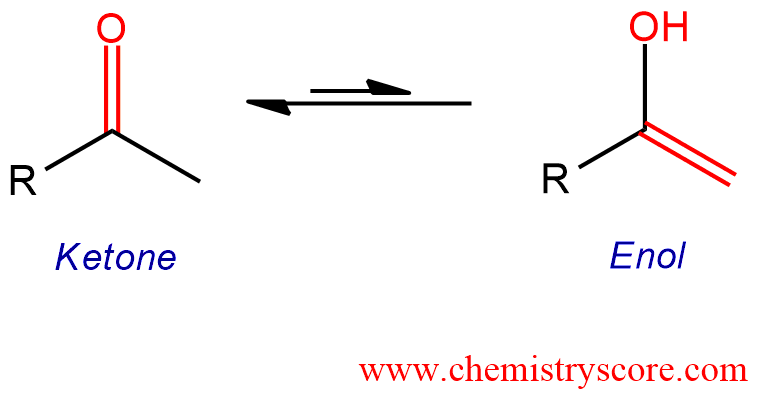 Tautomerization always requires two steps (protonation and deprotonation) but the order of these steps depends on whether the reaction takes place in acid or base. In the acid-catalyzed process, the enol form is protonated at the double-bonded carbon. The resulting cation is resonance-stabilized by the attached hydroxyl group and its deprotonation then gives the product (keto form). In the base-catalyzed reaction, the base removes the proton from the enol oxygen. The enolate ion is obtained which is stabilized by resonance. C-protonation of enolate which is slower than the previous step furnishes the thermodynamically more stable keto form.